There will be a second parent meeting for parents who are helping prepare their children in making their Confirmation on Monday June 18 at 7pm in the staffroom. Mrs Winders will also be taking two sessions during school time and children will practice with Fr Wayne and Bishop Dooley on Friday June 22 at 1.30 pm in the church. Confirmation Mass will be with Bishop Dooley June 24 at 9.30 am followed by a shared morning tea afterwards in the Dean O'Reilly Lounge. Mrs Wylie and Mrs Winders will email further details closer to the time. Suzanne Aubert Birthday. New Zealand’s first Saint? 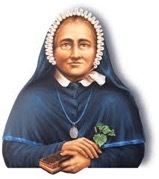 Suzanne Aubert (19 June 1835 – 1 October 1926), better known to many as Sister Mary Joseph or Mother Aubert. She started a home for orphans and the under-privileged in Jerusalem, New Zealand on the Whanganui River in 1885. Suzanne first came to New Zealand in 1860 to educate Māori children. Among many other great works of faith and compassion she founded a religious order, the Daughters of Our Lady of Compassion in 1892. Suzanne also started two hospitals in Wellington; the first, St Joseph's Home for the Incurables in 1900, and Our Lady's Home of Compassion in 1907. This is not to mention many other works of charity, including medicine.